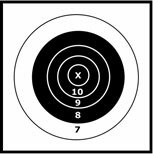 One of the most frustrating situations a shooter can encounter is not being able to clearly see his or her target. This was a lesson I learned (very painfully) several years ago at a Black Powder Cartridge Silhouette match at Friendship, Indiana. I was assigned to the first relay of the day. The weather was, for the most part, absolutely beautiful. The sun was shining, the wind was calm, and as I approached the firing line for my relay, I was confident that I was going to knock down all 10 rams without a hitch. Was I ever wrong! Even before we had finished taking our sighter shots to get on target, I couldn’t see a thing. The smoke from the BPC rifles just hung like a bright cloud of white cotton in front of my sights. Because there was no wind, the smoky cloud just continued to build as rifle after rifle discharged more and more of the view-obscuring substance into the air. The result — I think I only hit one or two rams that day. The old saying “You can’t hit what you can’t see” was certainly true that day. It was at that match that I learned to be careful what I wished for. No wind can actually be a very bad thing. Although you won’t have to worry about it altering the path of your bullet as it speeds towards the target, some wind is necessary to clear away the smoke from the firing line so you can see the target. If you’re shooting during a match when wind conditions are such that the smoke is obscuring your view of the target, ask your spotter to help you determine when the best time to shoot is going to be. Have him watch the smoke and tell you when a clear spot, or at least a light spot, is going to drift in front of your shooting position. You may even want to have him tell you when to fire to take advantage of the best conditions. Another tactic that you can try is to either put a larger sight insert into your front sight or remove the front sight insert altogether to give you the best view of the target possible. Although you may not be able to shoot with great precision, you may be able to at least stay on the target. Remember, a “6” is better than a “Miss” any day!